A dazzling black diamond ring depicting the darker side of Disney, this marvellous Maleficent ring presents intricate imagery of twisted thorns as part of the Enchanted Disney Fine Jewelry Villains collection. Carefully crafted from black rhodium plated silver, this captivating ring features bold black diamonds totalling 1/5ct, set to bring the twisted thorns to life. 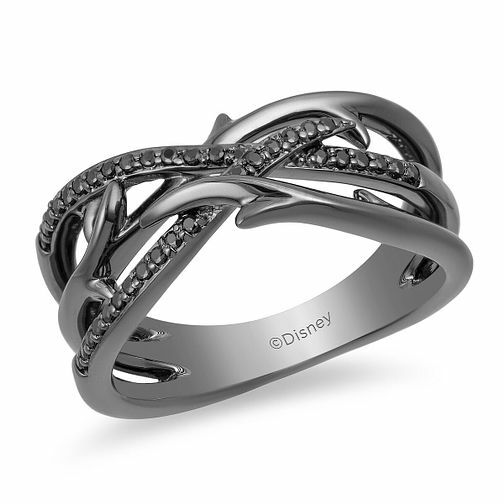 A wickedly wonderful accessory..
Enchanted Disney Villains Maleficent Diamond Ring is rated 5.0 out of 5 by 1. Rated 5 out of 5 by Anonymous from Dark Secret I bought this ring for my wife for our 10th wedding anniversary, when I looked at it on line I was not so sure about it? But as my wife’s favourite Disney character is Maleficent it appealed to me. On receiving the item I was pleasantly surprised, it has a very dark character and the diamonds shine jet black, the one thing that did surprise me was the weight, I thought it would be very light and possibly cheap looking, but it is not, the ring has some weight to it and it does look spectacular in the light, it also comes in a fantastic display box. Overall I am very happy with my purchase from H Samuel and the speed of the delivery of this item. 5 Stars from me.